The Clinique Non-Streak Bronzer for Men ( Model 0412264546393) is a new grooming product that improves facial complexion to reveal a sun-kissed look that appears natural. The product is perfect for those who need to spruce up their looks for a decent price. Times are changing, and even men need to groom themselves so that they can look their best at any special event. Your friends will never know that you’re using it! Clinique’s Non-streak Bronzer for Men comes in a cool black tube as a dark gel that is applied in small amounts to the face. The product offers a natural and durable tanned appearance. The formula is oil-free and does not clog pores, according to the manufacturer. The tan remains on your face through thick and thin, even in rain and while swimming. While I have never ventured into my local pool while using the product, the bronzer does appear natural and does not look fake at all. Not only does it improve my facial complexion, but it does not harm or aggravate my skin. I cannot say that the product is as durable as the manufacturer says, but it does stay on for quite some time. And most importantly, it looks great! This product is great for any man that is not ashamed to spruce up his looks in a natural-looking manner. It is ideal for any man that needs something a little extra for a job interview or a night out with friends. Tans look great on anyone, and the ladies will be sure to notice! 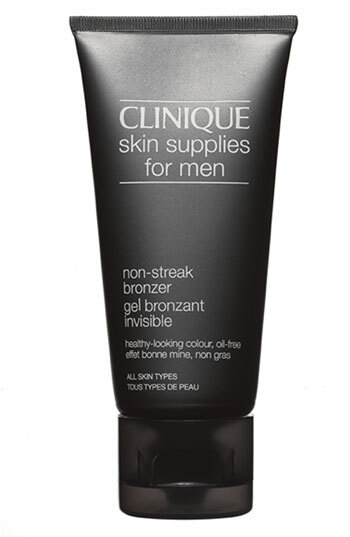 The Clinique Non-Streak Bronzer for Men lives up to all its expectations, and definitely improves facial complexion. It Is easy to use, and ideal for any skin type. The product is also very affordable, especially since it lasts so long. The bronzer costs anywhere from $16-$20, which is a small price to pay for its effectiveness and shelf-life. However, the product is a bit strong, and works best when combined with your favorite facial moisturizer. The product spreads more evenly in such a manner. And because it is so strong, I have to be careful not to add too much, and even apply a bit to my neck area to make the bronzer look as natural as possible. When using the product properly, I definitely saw a great improvement! Even celebrities such as George Clooney and Zac Efron are known to use similar products to improve their appearance. Clinique’s Non-Streak Bronzer for Men is a must-have if you want to add something extra to your skincare regimen in order to improve your appearance and look tanner. It’s easy to use and lasts much longer than you’d imagine, so it’s definitely worth a pop!